Many of us are chronically distressed by the suffering we see around us. It confronts us in the 24/7 news cycle, in social media, in what we pass on the street every day. We live with a longing to be rid of the pain and guilt that we experience in witnessing all of this suffering. That longing drives us to cast about for things to do that would “fix the problem.” We try and we urge others to try political action. We give and we urge others to give. Even so, we still feel our discomfort and our seeming failure to accomplish a fix. The Gospel of Mark tells us a story in which Jesus addresses this pain and guilt, yet we tend to miss his message—in part because centuries of tradition have focused so much on him rather than on what he was teaching us. At one level, this is a story about men who resent an independent woman wealthy enough to pour out an entire jar of nard. At the level of evangelical storytelling, it is the author of Mark pointing his audience toward the crucifixion of Jesus. What interests me, though, is the paradoxical play of sacred story. Jesus is direct in his criticism of his friends: “There will always be the poor around, and whenever you want you can do good for them.” He is more subtle in his challenge. Come back to the present moment. We are all with each other now. This woman is not afraid to acknowledge my mortality—or her own, or yours. Instead of distracting herself from that reality with worldly concerns, she is blessing me right now. Quaker faith and practice internalizes the crucifixion. Each of us is invited to embrace the death of “the Christ within” which is our true self. Until we are able to do that, we continue to be distracted by fear of our own mortality. How much can we truly serve others while we are so distracted? Ointment pot, Egypt, 2000-100 BCE, L0065469 Credit Science Museum, London, Wellcome Images. Library reference no. : Science Museum A634855. Copyrighted work available under Creative Commons Attribution only license CC BY 4.0. Egyptian vessels from this era vary in size and shape. Very small jars held expensive liquids such as opium suspended in oil. Large jars stored wine and household ingredients. The tapered bases of oil jars such as this could be pushed into the ground to keep the jar upright. 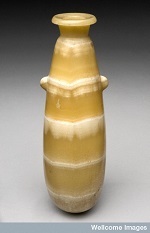 This example is made from alabaster. Other materials used included wood, clay, metal and glass.